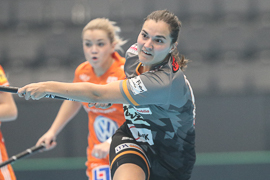 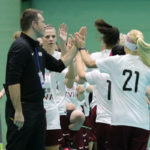 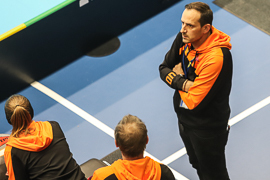 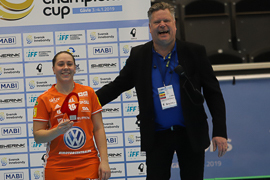 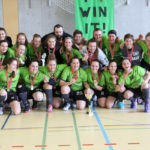 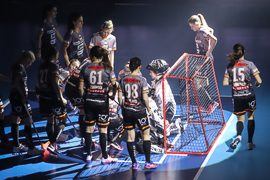 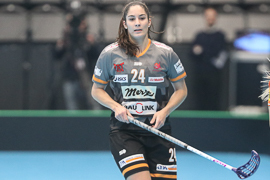 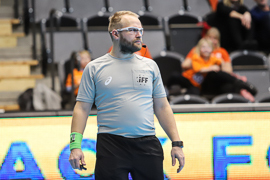 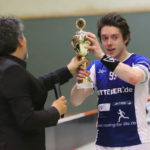 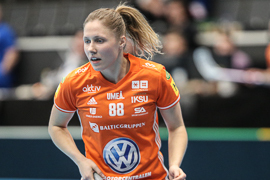 Playing the Swedish champion and reigning Floorball Champions Cup holder IKSU from Umea was likely the most unfortunate task Swiss Champion Piranha Chur could imagine on their Champions Cup campaign. 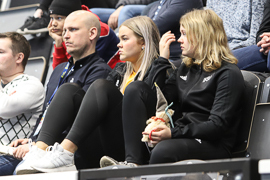 The Northern Swedish came with Veera and Oona Kauppi and Swedish legend Emelie Wibron. 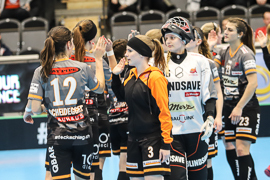 In opposition, Piranha traveled to Sweden with a strong lineup including Corin Rüttimann, Seraina Ulber or Flurina Marti. 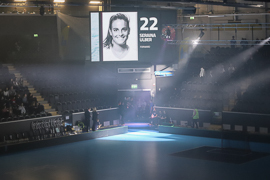 There is a full size picture gallery for this match. 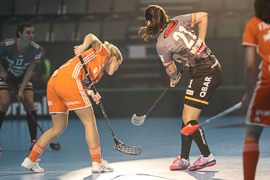 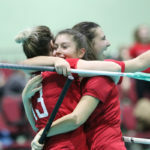 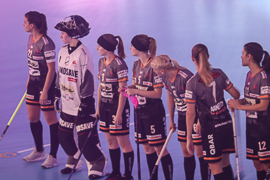 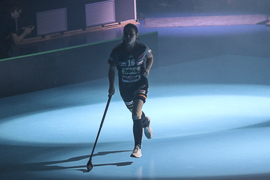 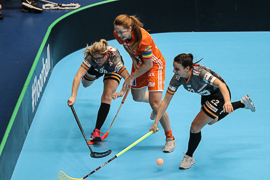 The first period was an impressive demonstration of elite women club floorball. 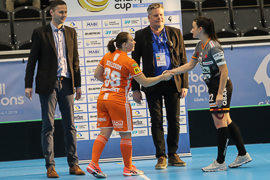 The match was a one-sided massacre with Jill Münger being the key victim: a period score of 6-1 gave a strong hint that IKSU will not discuss about who will gonna be promoted to the final. 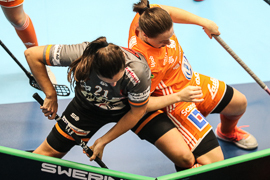 Even when Katrin Zwinggi converted a nice fast break after six minute to close up the intermediate score to 2-1, Alice Gransted found the sportive answer quite thereafter. 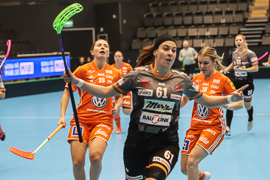 The other IKSU goals were scored by Myra Aggestal (2), Tova Eriksson, Amanda Delgado and Veera Kauppi. 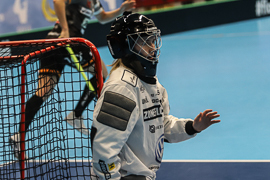 When Sofia Joelsson scored the 7-1 just after a minute of the second period, the match seemed to roll on, even with Corinne Waldburger being the new Chur netminder. 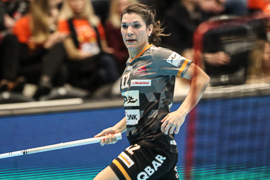 But Chur played better (and maybe IKSU also saved their powers for the finals) and added another goal by Luana Rensch in the 29th minute. 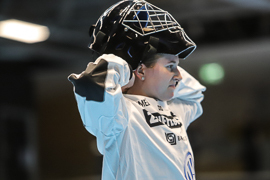 The third period had plenty goals again – but the score was even with IKSU goals by Emelie Engström (2), Joelsson and V. Kauppi and Chur scoes by Rüttimann, Alessandra Schneller and Margit Scheidegger. 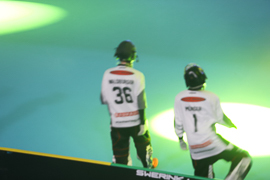 Chur even felt to have slight chances for a closer score. 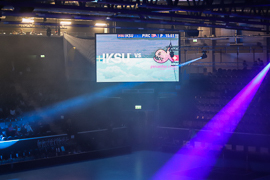 But whenever they got too strong, IKSU just increased their effort. 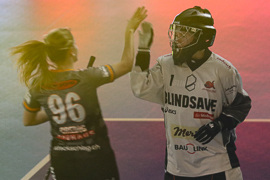 There was no closer distance than four goals. 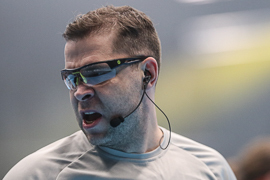 Okay, that’s the demonstration you had to expect. 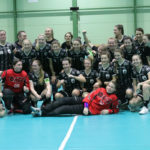 IKSU showed that that they are the favorites (again). 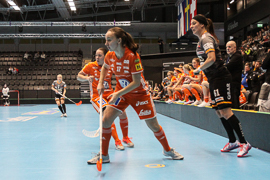 The first period was impressive – and in the remaining match the Swedes just kept control. 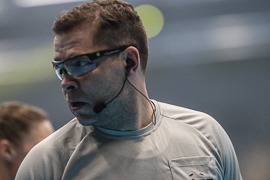 Piranha did not show a bad match at all, especially after the first-period-shocker. 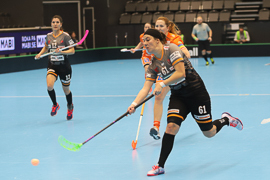 Two even score periods are a strong results – even if you trail by that amount of goals. 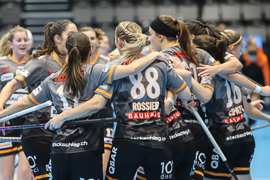 But overall, the difference between the teams – and: between the leagues – is just too large. 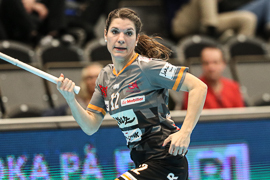 IKSU showed that: no chance for a Swiss team to beat them – even if they do a quite good job!